The Reflection Gel replaced the Adhesion Gel in the Portal 2 Authoring Tools in the major update of their first DLC. It's still unused in both the single-player and multi-player campaigns. The gel, when painted on a wall, floor or ceiling, can reflect lasers off of it, like the Discouragement Redirection Cube, and can be used on the same surface multiple times. Since the properties of the gel were left in the code of Portal 2, community map makers incorporated the gel into some of their maps, only having some problems with missing textures and some animations. The Reflection Gel uses a slightly darker texture than the Conversion Gel, but it does not have the same properties, like making a non-portal conductive surface able to conduct portals. It's one of the two gels that wasn't based on any of the Tag: The Power of Paint gels. The other one is the Conversion Gel. One of the functions of Reflection Gel left in the code of Portal 2 is being able to cancel the Propulsion Gel's effects on objects. It's a leftover property of the unused Adhesion Gel. When this gel hits the player, it shows the screen effect of the Propulsion Gel. The gel is also able to reflect the laser emitted by a Turret. However, it is purely cosmetical and has no effect on the turret's vision. 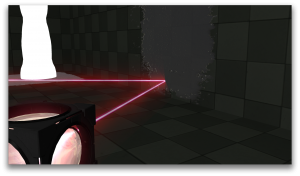 The effect of the Reflection Gel on a laser on the wall, in a modded Portal 2 community map. This page was last modified on 25 September 2017, at 00:53.